Did Jesus feel this way? When Jesus was spreading his message did he understand how difficult it would be to change the hearts and habits of people throughout the world so everyone would have a sense of hope and opportunity? I'm not sure that was even his purpose, but I'm not writing with a goal of debating different religious history or philosophy. I picked this graphic because it shows the heavy burden carried by anyone who works to provide hope and opportunity to oppressed people in the world, or who seeks to close the gaps between rich and poor, or reduce the greed and corruption in government and formal institutions of power. It seems impossible, but many start out every day with this goal in mind. I've written a blog article around EASTER Sunday every year since 2006. Just like scripture in the Bible or the Koran is over 2000 years old, it has a fresh message every time it is read. Thus, throughout the year I hope those who visit the Tutor/Mentor Institute blog will look back at messages, like these, posted in the past. I apologize for another long post. However, I’m trying to tie several streams of thought together. I hope you’ll follow and add your own thinking. Last Sunday I read an article in the Chicago Tribune titled “Pope wants more focus on poor.” I’ve been working on a story about this all week. Then today I saw this TED talk, where Bono talks about data and facts and ending extreme poverty. If you’ve not been totally absorbed on your NCAA Basketball Brackets, you’ve probably read about the new Pope and his commitment to “walking the talk” when it comes to setting an example for other Catholics and people of faith. While most people probably have read or listened to something about the new Pope, I suspect most have not been having a soul searching discussion about philanthropy and how the system of charitable giving does too little to support social sector organizations serving the poor and addressing complex environmental, social and health problems that plague the world. I posted an article a couple of weeks ago about Dan Pallotta’s TED talk, titled The way we think about charity is dead wrong. That TED talk has stimulated a number of discussions on social media space. I’m part of three on Linked in, such as this one. This good debate here over definitions defining our entire industry does not hold a candle to the thousands-years-old debate in the church. Just these two NYT articles today about the power-grabbing intrigue in the Vatican ( http://www.nytimes.com/2013/03/19/world/europe/pope-francis-faces-an-entrenched-curia.html?hp ) and the perceived goals of the new pope ( http://www.nytimes.com/2013/03/20/world/europe/installation-of-pope-francis.html?hp ) mirror our debate here. Bono’s TED talk describes the 3000 year old fight against poverty. He’s fighting the same fight as the POPE, but on a different battlefield. It’s the same fight Pallotta is fighting. It’s the same one I’ve been fighting for nearly 20 years. When BONO talks about using data he does not mention the most important asset he offers to the war on poverty, which is his own celebrity visibility. He’s been blessed with the ability to draw the attention of millions of people, wealthy and poor. When Pallotta talks about lack of advertising available to social sector organizations, he is describing how so few organizations have the celebrity power of Bono, or the POPE, to attract and educate donors and keep them focused on their work for dozens of years. When BONO talks about using data he uses charts and graphs. I want to see him using , geographic maps, showing at the zip code level where extreme poverty, or extreme gaps between rich an poor, are most concentrated. 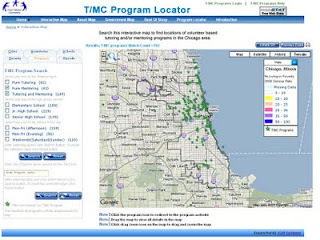 I’ve used maps in many articles to propose a marketing strategy that engages people from every Catholic Church in the Chicago region in on-going efforts that help existing volunteer based tutor/mentor programs get the talent, technology, operating dollars and ideas each needs to constantly improve what they do to connect youth and volunteers and transform the lives of both. In addition, when BONO talks of using data, I hope that the collection of data, and responses to BONO’s outreach, will lead to web sites that visually map all of the issues that contribute to extreme poverty, or extreme disenfranchisement. The pie chart shown on this Glasgow site is one example of how this might be done. 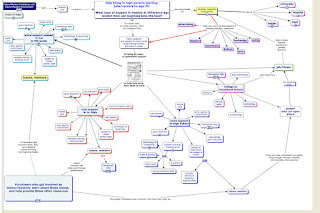 The Internet has created the ability to mine data from all over the world, and for teams of design and visualization engineers to create concept maps, like the one above, that shows the range of age-appropriate supports kids need as they move from birth, through elementary school, high school, post high school and into jobs. Similar maps could show how fighting disease in a poverty area also needs to be combined with concurrent efforts to fight corruption, improve education and technology access, and create jobs. If you’re building a skyscraper, every page of the blueprint show skills needed to complete the work described on that page. Everyone needs to be paid and have the highest level of skills. If we think of ending poverty as we do of building a new hotel, what are all the skills needed at different stages of the project? Maps like this can be interactive, animated, three-dimensional, and connected to data libraries that a) include research that provides a better understanding of the problem, and potential solutions; and b) links to web sites of organizations in different places that are working to provide a solution, but work with limited resources in many cases. This is where both Bono, the POPE and Pallotta’s TED talks intersect. Bono and the POPE provides celebrity power that is far greater than what Dan Pallotta or most of the rest of us in the social services sector, can generate. While Pallotta’s TED talk has received over 1 million hits, stimulating discussions in many places, how will this be sustained, expanded, then turned into actions that improve the flow of resources to thousands of places? Who is talking about this? Bono talks about ending poverty by 2028, and talks about the inertia that might prevent this, or the momentum that might make it a reality. The articles about Pope Francis show that efforts have been made to reform the Catholic Church for centuries, with little success. If Bono and the Pope and other leaders were to build map-based data bases, and concept maps, that work like blueprints to show work that needs to be done in many places on an on-going basis, they could draw more consistent attention to the problems with philanthropy that Pallotta describes. 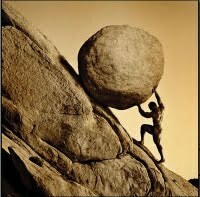 As I’ve written these articles I feel that I have three mountains of obstacles to overcome. 1) Donors, businesses, public leaders and individuals are already doing a lot to try to help youth and families living in poverty. Thus, asking them to do more, which is what the POPE is asking, meets a lot of resistance. Pallotta’s message is that unless we find ways to draw more resources into social sector organizations, so they can innovate, hire and retain the best talent, experiment and even make mistakes that they learn from so they can get better at what they do, we’ll continue to not achieve our long-term goals of helping kids born in poverty live adult lives out of poverty because of the help they have received from birth to work. 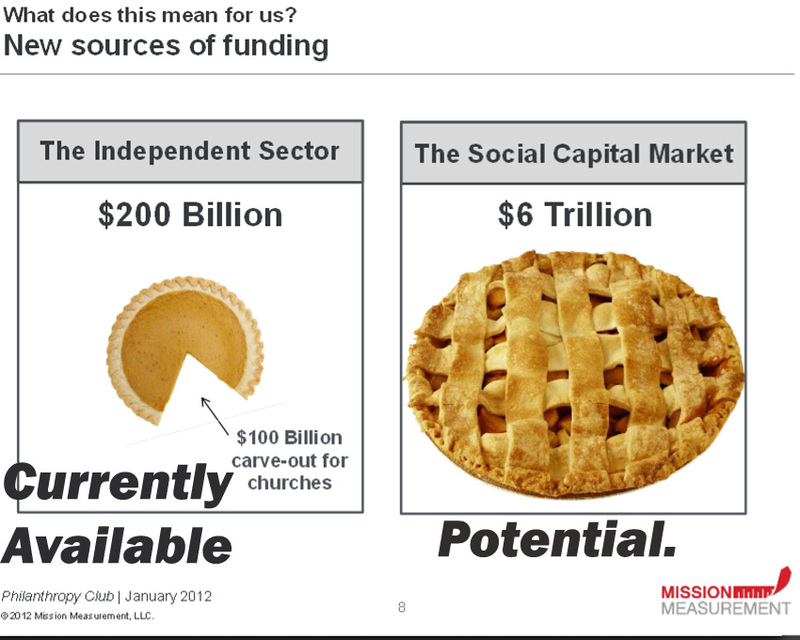 2) If you’re already a secure, well funded non profit, who is challenging you to do more than what you are doing? If no one is advertising, or trying to educate the public so they can look at an organization's web site and make a judgment as to whether or not the organization deserves financial support, how can we move beyond superficial measures, such as money spent on "overhead"? If no one is aggregating information and web links pointing to organizations doing similar work, how can you benchmark yourself against what others are doing, to see where you can improve? What’s your motivation if your donor base is constantly giving you money because of your history and reputation, or the names of the people on your Board of Directors? 3) If we don’t map where the need is for social services, and where existing services are located, with information that maps categories of organizations serving similar population, we won’t know if the money we are spending is reaching all of the people who need that help. We could fill every NCAA Tournament Basketball stadium with fans, or fill a football stadium for a visit by the Pope, and still not have people from every poverty neighborhood represented. This graphic shows the role of intermediaries who connect people who can help (volunteers, donors, idea generators, etc.) to organizations in places where help is needed. If the Pope, Bono, Pallotta and thousands of others use their daily visibility to draw people to information that shows where and why they are needed, and motivates them to give time, dollars, talent, etc. they can continue the momentum Bono describes and provide the advertising support and resource flow that Pallotta describes, to all of the places where the poor live in need of extra help. I’ve posted articles like this on my blog and web site for 15 years with the goal that someone in the Vatican, Bono’s team, the Mayor’s office, etc. would read them and bring them to the attention of these leaders, so they can add the ideas into their own leadership efforts. As I build a library of content on sites I host, I point to sites with additional ideas. Over the past few years I've written more about network building, learning and point to virtual events such as the Education, Technology and Media MOOC, ETMOOC which demonstrate how thousands of people could be connecting, sharing ideas and innovating ways to reach people in high poverty with resources that aid youth and families in overcoming the challenges they face. I won’t be alive in 2028 to see if Bono's dream comes true, but these ideas can be if you read, reflect and share them with others. I wrote about this series of Mentoring articles in this article yesterday. After re-reading these mentoring articles in Crain's Chicago News, I see that I was quoted, saying: "To build an expertise and to build participation, you need a core group of people to keep it all running. That's why funding these organizations is so important," says longtime mentoring organizer Daniel Bassill, president of Tutor/Mentor Institute LLC, a Chicago organization that aggregates information about non-school tutoring and mentoring programs on a searchable website." I repeat my message. Chicago and other cities need leaders to go beyond being mentors, to being marketers who plan strategies that make mentor-rich programs available to k-16 youth in all high poverty neighborhoods of the city and suburbs and keep them in place for the time it takes this year's class of 1st graders be starting jobs and careers in 15 to 20 years. We need the media to support this process with on-going articles that not only share the interaction of volunteers and youth and individual stories of success, but focus on the planning, data gathering, infrastructure building and on-going marketing needed to make mentor-rich programs available to k-16 youth in more places. 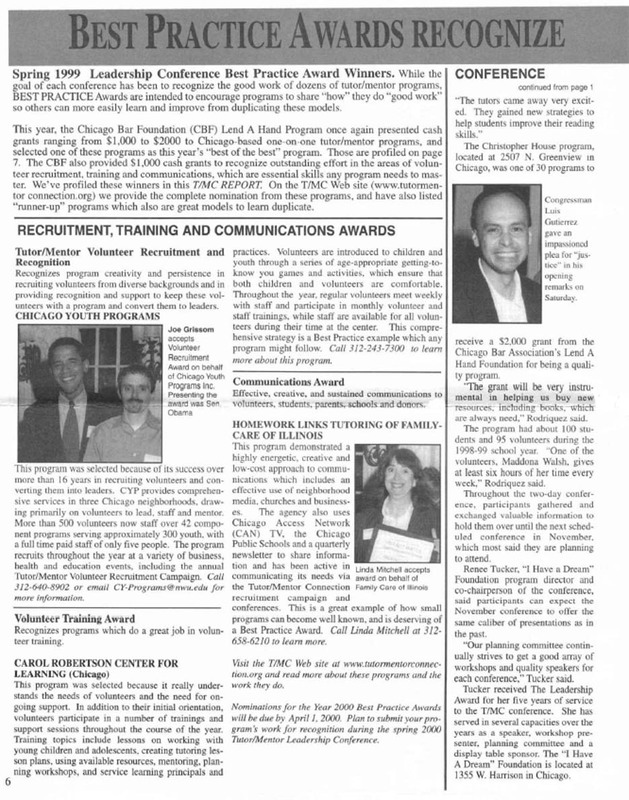 I host a Tutor/Mentor Leadership and Networking Conference in Chicago every six months (since May 1994) and would be delighted to have some of the business leaders profiled in the Crain's article become involved, as sponsors, and as workshop leaders who bring others into this discussion of "how we make good programs available to youth in more places". The next conference will be Friday, June 7 at the Metcalfe Federal Building. Click here to find a workshop presenter form. I was contacted a few weeks ago by Shia Kapos, who was researching a story on Mentoring for Crain's Chicago Business. I'm pleased to see that the March 17th issues has a FOCUS on Mentoring. I encourage you to read these stories and be informed, and inspired. What you don't see in these stories is any of the information I provided when I talked to Shia, or from the web links I sent here. I talked about how I've been trying to collect and aggregate information on tutor/mentor programs reaching youth in the non-school hours, and to create maps that show where these programs are located and where more are needed. I told her that I've never had the funds to do this as well as it needs to be done, nor to try to understand the distribution of school based mentoring. Yet I did invite her to look at the maps and write about what businesses could do to support the growth of mentor-rich programs in all parts of the Chicago region. This is THE REST OF THE STORY. 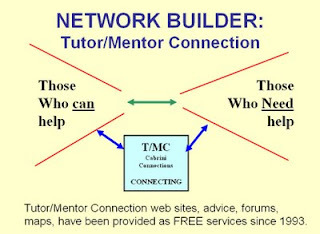 I encourage you to visit this section of the Tutor/Mentor Institute, LLC web site to read how maps can be used to support the growth of mentor-rich programs, and to see graphics that illustrate the long-term support needed to help young people go from elementary school through high school and college into jobs and careers. Visit the Program Locator to create your own maps and build a strategy that supports tutor/mentor programs around places where you do business. Big companies support multiple stores with central office strategies, and with long-term commitments. 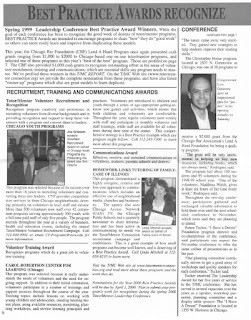 A business publication like Crain's would be an ideal partner to talk about business strategies that would help volunteers from different companies connect with youth in many well organized programs throughout the city, which are good because they are supported by on-going flows of business talent, dollars and technology. This is a deeper story than just the heart-warming stories of a few people connecting with a few kids. This is more than a sound-byte. It takes time to read, reflect, think, and innovate ways that the business community can do more than the good work it is already doing to reach more kids in more places with mentor-rich strategies. Thank you Crain's Chicago Business for posting these stories. Please use your editorials and on-going media ownership to lead an effort to tell the REST OF the STORY, over and over. Why Mentor? Does this Apply in Illinois? Below is a video created by the Mass Mentoring Partnership, which I'm connected to on Linkedin. The speakers are all from Massachusetts, but the message applies to Illinois and every other state. I've never had the resources, or found the local leadership, to be able to create a video like this. 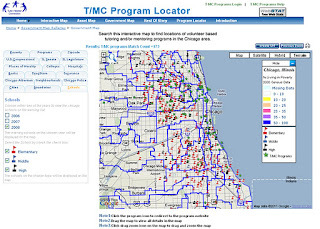 However, I have generated dozens of media stories and videos that talk about volunteer-based mentoring/tutoring and which point to a map-based Tutor/Mentor Program Locator Directory, that intends to draw volunteers and donors to constantly improving tutor/mentor programs in every high poverty part of the city. As new groups step forward to draw attention to mentoring and the needs of youth in Illinois, many will develop their own directories, and their own list of programs. Some will have greater access to business and political leaders and philanthropic support, so may be able to create videos like this with Illinois leaders as speakers. However, as they do this, I hope they will also point to the Strategy Maps, Tutor/Mentor Program Locator, the Tutor/Mentor Leadership and Networking Conference, and the library of ideas and resources that I've been building for nearly 20 years. 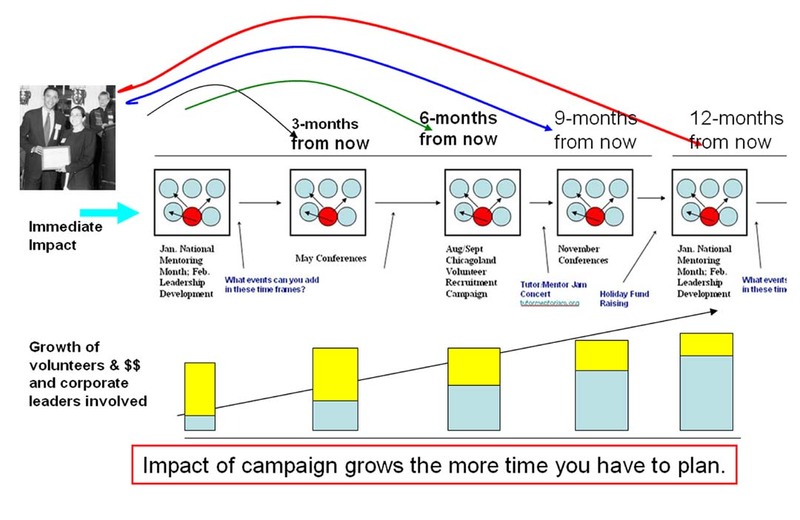 Illinois needs many leaders creating daily advertising and public involvement communications so that the number of people involved with mentoring grows, the resources available to individual programs grows, and the support continues to be provided for the next decade or more. 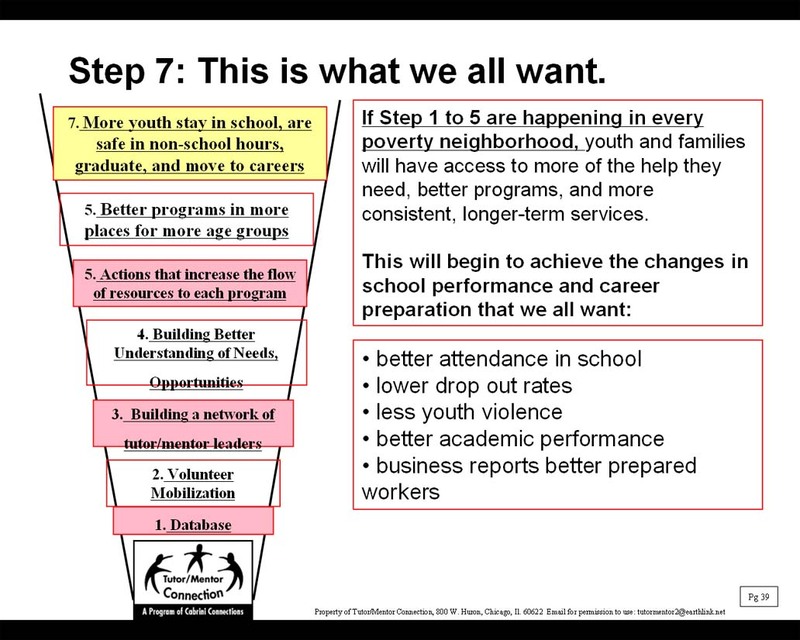 If we want to reach more youth living in poverty with mentor-rich programs that support those kids as they move through school and into jobs we need to change the way the programs attract resources, talent, ideas, etc. I first heard about Dan Pallotta a year ago and wrote about his ideas in this article. 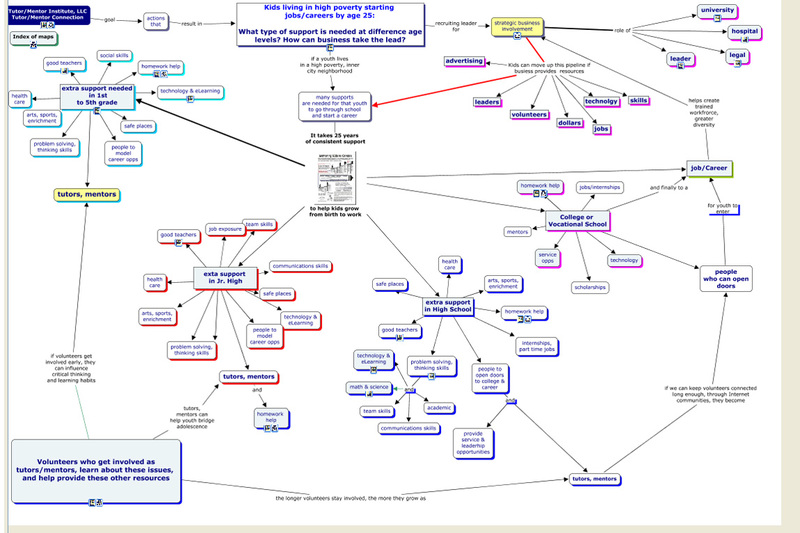 I mapped the ideas in this concept map. This TED talk does a great job of conveying his ideas. I hope you'll watch it and then look for ways to support tutor/mentor programs with daily communications that draw volunteers and donors to all of the tutor/mentor programs in Chicago and other cities ---based on what information they show on their web sites and what knowledge you build about the role these programs can have in the lives of kids. Take a look at the article I wrote last Friday. 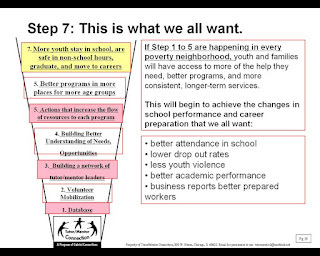 If we can attract a greater share of business funding we can do more to make constantly improving tutor/mentor programs available in high poverty neighborhoods. What do I mean by "constantly improving"? I don't think any organization starts out "great" even if they start out with millions of dollars. They grow to be great by learning from their own efforts, even their mistakes, and by learning from work done by peers and competitors. They become great by attracting and retaining talented people so that the knowledge and experience in the organization grows. They become a smarter organization that is constantly looking for ways to improve. Jim Collins wrote a book titled "Good to Great and the Social Sectors" in which he described this idea of constant improvement. I wrote about it in this article. We all want young people to move through school into jobs and careers, but few are doing the work that assures that constantly improving youth organizations are available in all the places where they are needed, with the constant flow of capital and operating resources needed to fuel the constant innovation needed to achieve this goal. Without changing the way we are able to attract capital and daily operating income few non profits can grow to be good, then great. 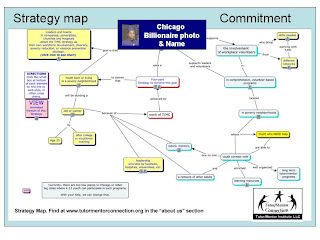 This graphic is from this PDF presentation which was presented by Kim Silver of Mission Measurement at a January 2012 Philanthropy Club of Chicago meeting. I hope you'll read it. It shows a path out of economic darkness for non profit sector organizations who are able to incorporate these ideas into their strategies. When Kim presented this she repeatedly used examples of tutor/mentor programs to illustrate her message, but out of over 40 people in the room, there were only five or six such programs represented. I said to myself, "What would it take to bring this presentation to the Tutor/Mentor Leadership and Networking Conference, where leaders of dozens of different programs could be engaged in an effort that identifies the "hot spots" that would motivate business leaders to dip into the $6 trillion dollar bucket of available funds to support programs throughout the city who do work that helps build a future workforce, while also providing learning and networking opportunities to their current workforce." I spoke to Kim about this and she said one challenge would be that every tutor/mentor program has different goals and serves different age groups. It would be almost impossible to build a set of common metrics that CEOs would respond to. She also said that I could not afford their services. The first challenge is that most programs use words to describe the services they provide, and those words don't communicate long-term or shared goals as well as pictures. Visit the Chicago Program Links and browse web sites of nearly 200 Chicago youth organizations to see how differently they each define mission. 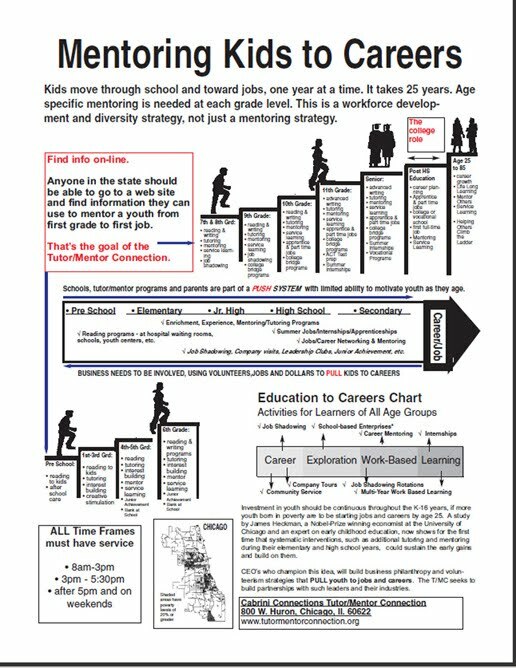 I have used graphics for many years to communicate a vision of helping kids through school and into jobs and careers. If a program is working with 4th grade kids what does that organization do to help build the support system these kids need in 5th grade and beyond? 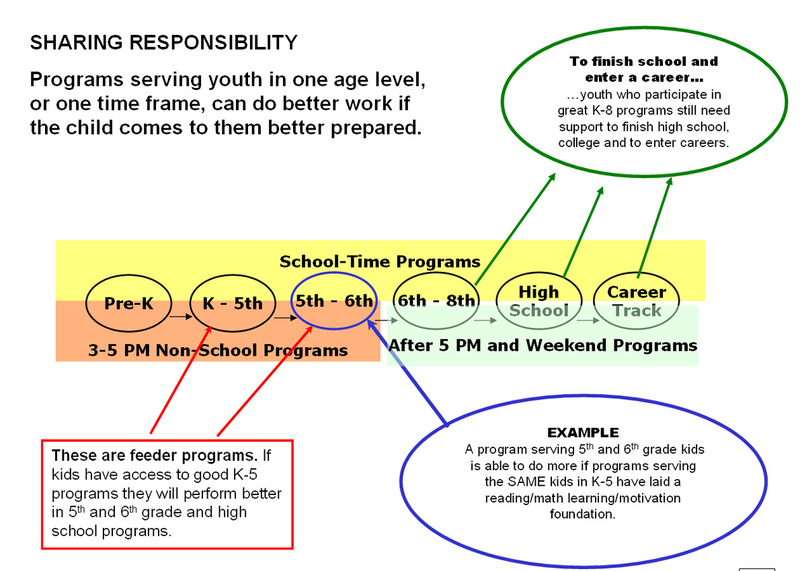 If a program works with 10th through 12th graders, what does it do to assure the neighborhood has feeder programs working with elementary and middle school youth. What is the "hot spot" of a business that each of these programs addresses? Are their common hot spots? How many programs define the different activities as part of an on-going, age-appropriate set of supports intended to help kids through school and into work? How many businesses encourage volunteer involvement in programs throughout the city, in roles beyond tutor/mentor, which include board, communications, tech support, planning and leadership development activities? How many companies use maps to understand their footprint in the city and to plan future impact? If CEOs would adopt this ROLE OF LEADERS strategy they would develop learning, research & development, and marketing teams in their companies, drawing from web libraries that show benefits to business, and that show what competitors are doing that they could duplicate in their own work. While companies compete for business they should be working collectively to develop the talents and skills of current and future employees. With states like Illinois cutting funds for eduction it is up to business to take steps that assure they have the workforce they will need 10 and 20 years from now. As I said, Kim told me I could not afford her company's services. That's the final challenge. If we can see where the $6 Trillion dollars in corporate talent and resources reside, who can work with myself and other tutor/mentor program leaders in Chicago to help us define and communicate visions and strategies that motivate CEOs to reach into this pool of resources to support career-focused tutor/mentor programs as part of corporate self interest? Instead of dozens of individual programs hiring consultants and trying to figure out ways to tap into this resource, why can't dozens of programs doing similar work try to find ways to motivate corporations to support all of us? Going through my Rolodex. Guess who I found. I've been collecting business cards for more than 20 years. While I have three full Rolodex files I also have cardboard boxes with hundreds, or thousands, of cards representing people who I've lost contact with. I keep these with hope that some researcher will want to do an analysis of the network I've been building to show how others might duplicate this effort. The people in my file represent just a fraction of those on my database who used to receive printed newsletters or in my email list who now get monthly email newsletters. 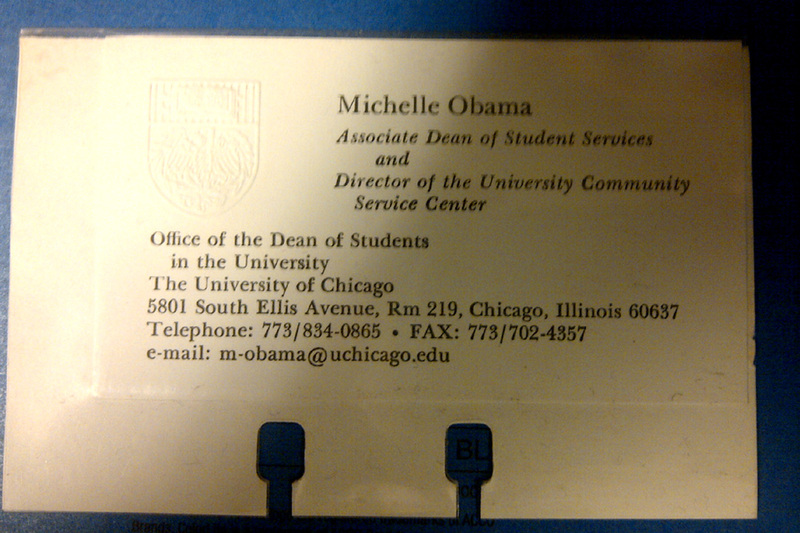 As I was going through the Rolodex this morning I came across this card, which I collected in the mid 1990s after a meeting with Michelle Obama when she was at the University of Chicago. Hmm. I wonder if this has any collectors value. When I met the future First Lady I did not know who she was married to. In fact, when State Senator Barack Obama was a speaker at the 1999 Tutor/Mentor Leadership and Networking Confernece I did not know as much about him as our other speaker, Congressman Luis Guitierrez. I also did not make the association with him and Michelle Obama. In this image from the Summer 1999 newsletter, you can see a photo of Barack Obama, who was a speaker at the May 1999 conference. I wish I could say that these two connections, or the appearance of Congressman Guitierrez at the conference, had led to life long support for the ideas and strategies of the Tutor/Mentor Connection, but that has not yet happened. But it can happen tomorrow, or in the future because since 1999 I've put most of my ideas on web sites where anyone can find them and spend as much time as they want looking, reflecting, and thinking of ways to incorporate these into their own leadership. Using Twitter, Facebook, Linked in, Google+, Mobile phones and other communications technologies we're all only a few steps away from each other and the most powerful people in the world. In the Education Technology & Media #ETMOOC that started in January I've been exposed to more than 1600 people and a wide range of ideas for digital learning and story telling. One participant, Paul Signorelli, from San Francisco, has written a series of articles showing the value of the #ETMOOC. I encourage you to read them and visit http://www.etmooc.org and read more about this way of connecting and learning from others. As President and Michelle Obama leave the White House in a few years they will still be young people and well able to lend their time, talent and fame to bringing people together on-line and face-to-face to support this effort and many like it taking shape all over the country. We have time for them to find their way here. However, we have an urgency that they get here quickly as we lose young people to poverty, violence and poor schooling every day. Today the Chicago Tribune introduced us to 17 Chicago area residents who are among the richest people in the world. You can meet them here. I saw another article in the paper talking about how the Chicago Bears were considering offering naming rights to their new facility in Lake Forest, which might generate up to $2 million a year in revenue. That got me thinking. 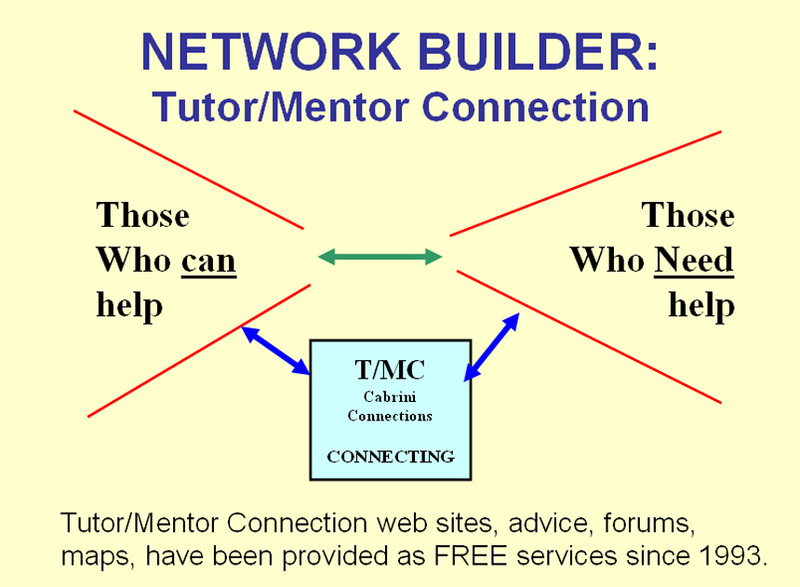 I wrote this article in August 2011 suggesting that we might offer naming rights to different components of the Tutor/Mentor Connection or Tutor/Mentor Institute, LLC, just the way sports teams, colleges, hospitals and art museums do. Take a look at these logos. Could a local or national advertiser or benefactor put their name on one of these platforms? How about the Tutor/Mentor Leadership and Networking Conference? The Broad Foundation funds a number of initiatives intended to build stronger leadership of public school systems. Why wouldn't a philanthropist fund an effort to build strong leadership for community based and non-school initiatives that expand learning opportunities and help prepare youth to come to the traditional school better prepared to learn? I created this list of Think Tanks a year ago. Look at how many have the name of a benefactor. 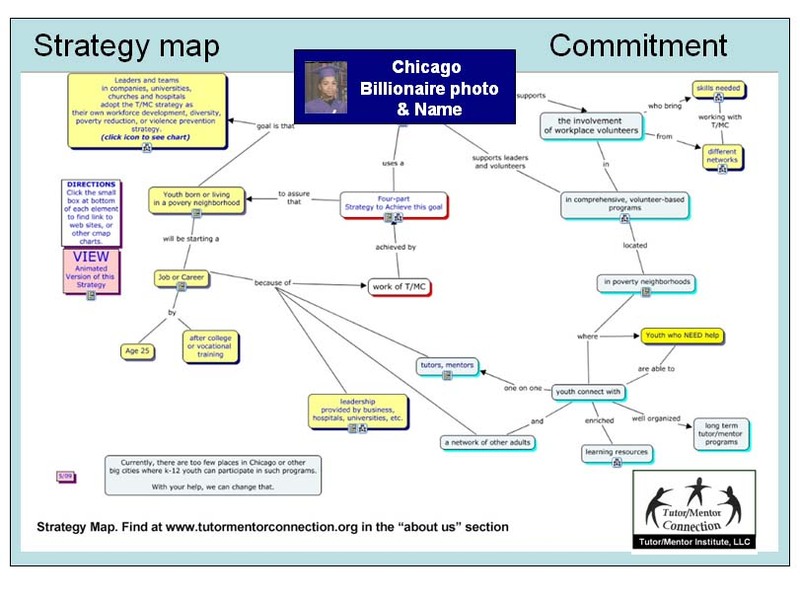 Why can't the Tutor/Mentor Institute have the name of one of Chicago's wealthiest people associated with it? 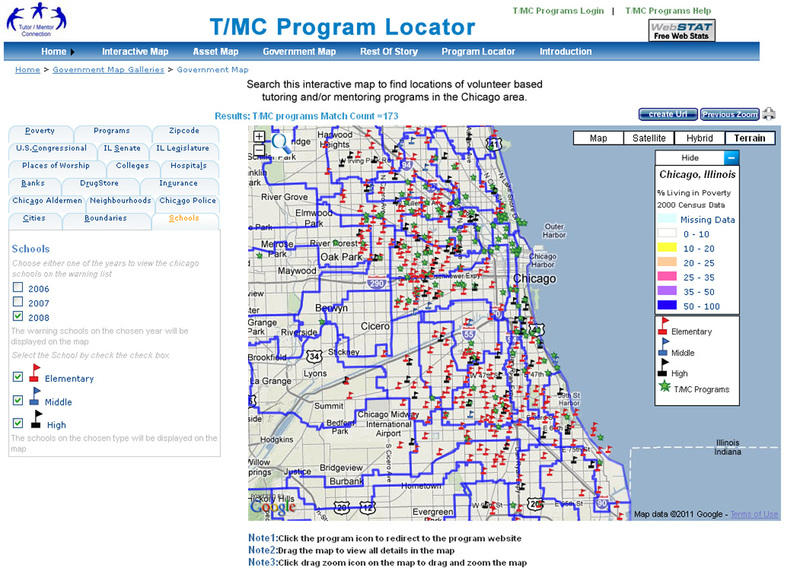 Or how about putting a sponsor name on the Tutor/Mentor Program Locator's Interactive Map. 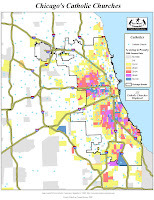 Investing more dollars will not only enhance the features of this map, but it can also increase the number of people in Chicago who use it to support the growth of tutor/mentor programs in high poverty areas. 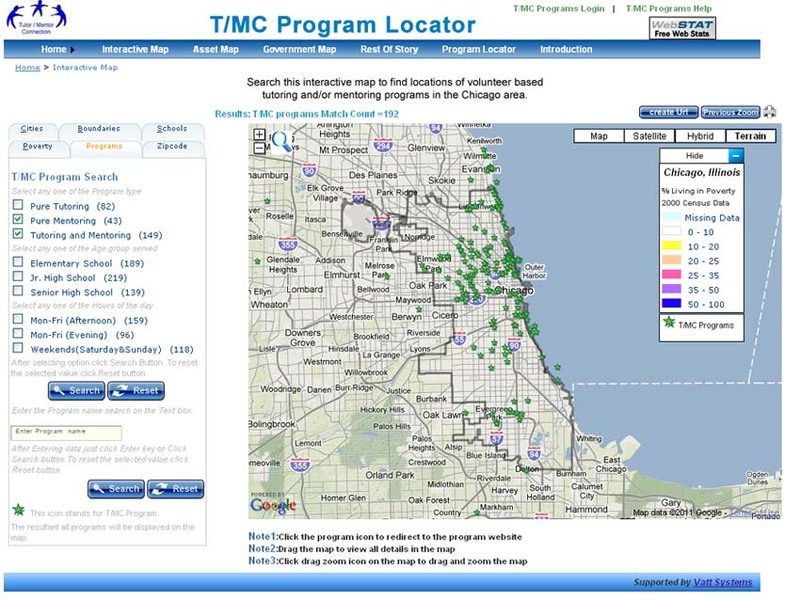 It could lead to the Program Locator being used in other cities, not just Chicago. Attaching a benefactor's name to these assets can generate revenue to fully develop them and the ideas shown here. It can help us and others connect, share ideas and work together to enhance the growth of programs that help youth overcome poverty and reach their fullest potential. However, a benefactor making this investment would also be signaling his/her commitment to the strategy shown in this map. 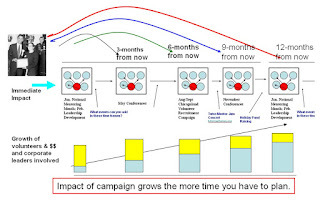 It does not cost anything, or generate revenue for the Tutor/Mentor Institute, for a leader to adopt this strategy and put a page with this information on his/her web site. It does require a commitment to long-term actions that reach youth in more places with age-appropriate supports that help those young people grow up and find places in work and neighborhoods where they can raise their kids without worrying about someone shooting them while they come and go from school every day. I've been a fan of the Internet since it was first introduced to me by one of my volunteers in 1997 or 1998. I love the potential that anyone can post an idea to a blog or web page and that idea can be viewed by anyone in the world, even by one of the seventeen billionaires in Chicago. Or by someone who has less wealth but a deep commitment to use the wealth they have to support the ideas shared on this blog and the Tutor/Mentor Institute, LLC web site.